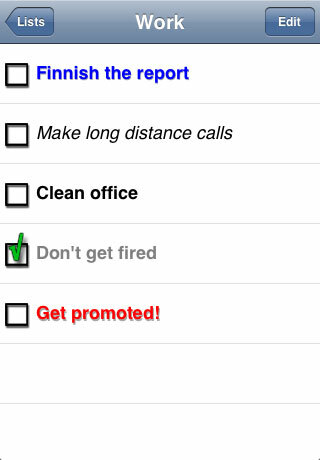 Toodles is a simple- to- use To Do list task manager. In addition to its ease of use, it has optional features for advanced users as well. Take Toodles for a spin today and find out why it's better to manage your time than manage your list of things to do. Simple interface - There is no learning curve! Just install from the App Store, and you are ready to take control of your tasks, and say, "Toodles!" to your to-dos. Landscape mode - Turn your iPhone or iPod Touch on its side, and gain the benefits of a larger, easier to use keyboard. Automatic hide/delete completed tasks - When a task is completed, it will automatically be hidden after a customizable number of days. It can also be automatically deleted from the list after a further waiting period. You will never have to manually delete a completed task again! 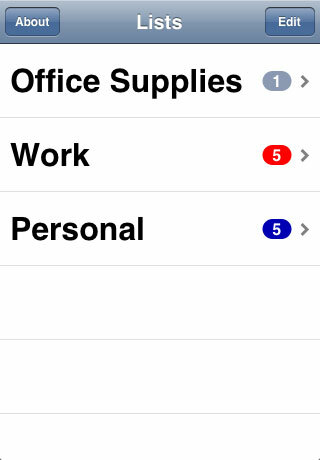 Customizable lists - Keep your tasks organized with as many customizable task lists as you need. Each list is configurable with a different default value for its tasks, letting you save time. Custom list orders - Reorder any list so you can always find the task you're looking for. List counters - Each list will optionally show the number of its tasks to be completed and their priority. Customizable font sizes - Squinting at tiny lists and excessive scrolling are now things of the past! Change the font size for lists and tasks independently to suit your eyes. Optional icon counter - Always know how much work is ahead of you without even launching Toodles! Or, if you prefer a minimalist look, you can turn it off. 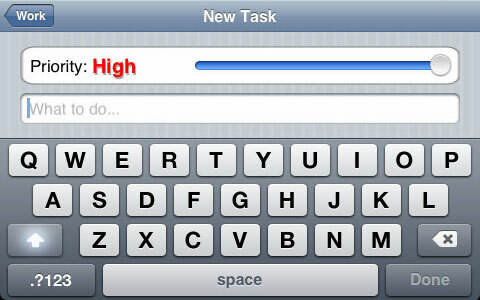 Four task priorities - Prioritize your tasks: low, medium, or high. If you have things to track that you don't want to be reminded of, there is also a "hidden" priority that will let you track your tasks without them being shown on the application icon. List default priorities - Work is not as important as play (or is that backwards?). Set a priority for a list, and any tasks created for it will automatically be set. You can still customize each task as needed. Please e-mail toodles@toscaledesign.com with any questions, comments or suggestions regarding Toodles.